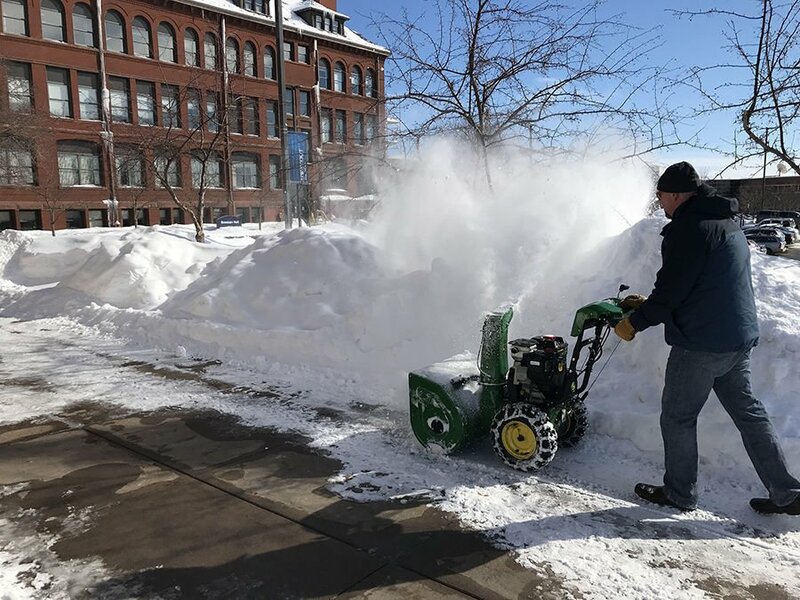 Zenon Smolarek, associate director of Facilities Management, uses a snowblower to widen a walking area near Bowman Hall. Like most homeowners in west-central Wisconsin, Mike Smith of Menomonie has had it up to his eyeballs — almost literally — with the record amount of snow that has fallen recently. His disdain for all the snow runs a little deeper, however. Smith is grounds supervisor at University of Wisconsin-Stout. He and four other staff members have had the unenviable job of keeping the sidewalks, driveways and parking lots cleared daily for more than 10,000 students, faculty, staff and visitors. Think you had it rough shoveling and blowing the 50-plus inches that fell in February? How about having to keep up with 17 miles of sidewalks and 26 acres of commuter parking lots? When Smith gets home at night, then he clears off his own sidewalks and driveway. 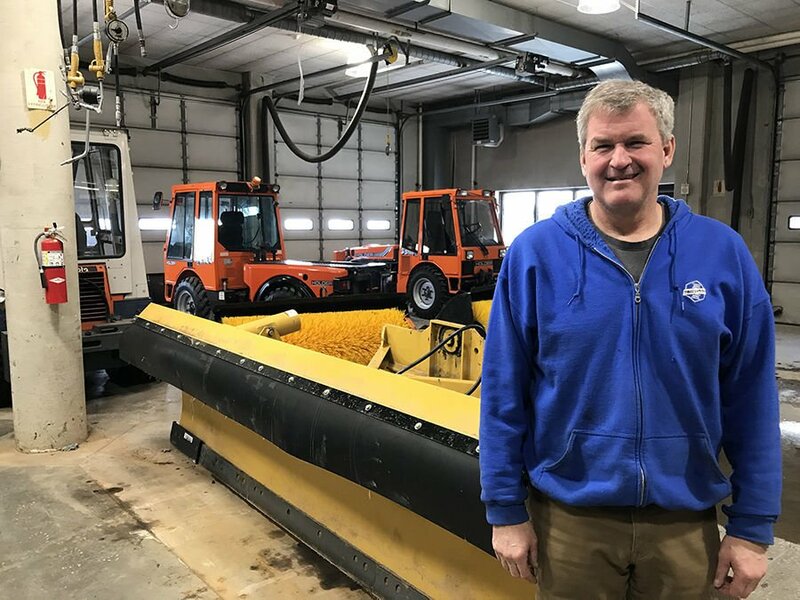 “Mother Nature is not always nice, and this year she has not been nice,” Smith said from his office in the University Services Building off Broadway Street, surrounded by snowplows and other snow removal equipment and tools. Some of his vital equipment isn’t made of steel: Computers help staff track the weather so they know when to get to work. “We’re all weather geeks down here,” he said. The onslaught of snow has meant many long days and some weekends for his crew operating four snowplows. A typical shift includes plowing from 2 a.m. to 7 a.m. to get the campus open, followed by a break and then up to six or more hours back on the plow to widen cleared areas and move the burgeoning piles of snow. How bad was February? The university’s biggest snowplow, for example, was used 194 hours — or close to 10 hours every work day. In January it was used 32 hours. According to the National Weather Service, Menomonie received a record 57.3 inches of snow in February. Some crew members worked numerous 13-hour days in a row to keep up when the snow began piling up. Unlike local school districts that have had many snow days, UW-Stout didn’t cancel classes during the record-breaking February snows. Classes were called off late afternoon Jan. 29 and on Jan. 30 because of extreme cold. Canceled classes or not, about 2,600 students live in the residence halls, and faculty and staff still report to work daily, including some on weekends. The city of Menomonie clears the streets going through campus. The UW-Stout snow-clearing operations likely are the second biggest in the city, Smith said. During the blizzard that hit Feb. 23-24, his crew worked nine hours on Sunday, Feb. 24, to clear campus and another five hours on Monday. The drifts were so high in some places, more than five feet, that the snowplows couldn’t get through. A front-end loader was used to break through the drifts one scoop at a time. UW-Stout has 45 buildings on about 125 acres. The entryways and steps to those buildings are maintained by the custodial staff, not Smith’s crew. One of the challenges of using snowplows, Smith said, are the small obstacles on campus — fire hydrants, light poles, planters, trees, shrubs, signs and more — that can difficult to see and plow around when snow piles up. His crew includes Kathy Branch, George Deflorin, Ron Talford and Frank Wagner. Smith is proud of the work he and his staff have done in adverse circumstances and appreciates that students, faculty and staff have actually complained less this year about the state of sidewalks and parking lots, apparently sympathetic to their plight. One of those challenges has been maintaining nine additional lots where students park their vehicles for the semester. Clearing those lots has required a coordinated effort with the Dean of Students and Parking Services. Students are notified of a lot-clearing plan and must move their vehicles, often snowed under, to a cleared lot for a specified amount of time. At one of those lots, east of Johnson Fieldhouse, the snow was plowed into two rows about 18 feet high then moved to large piles. It took 20 hours of labor to clear the lot. Smith has worked at UW-Stout for 11 years. “I’ve never seen anything like this winter,” he said. How are the health and retirement benefits?